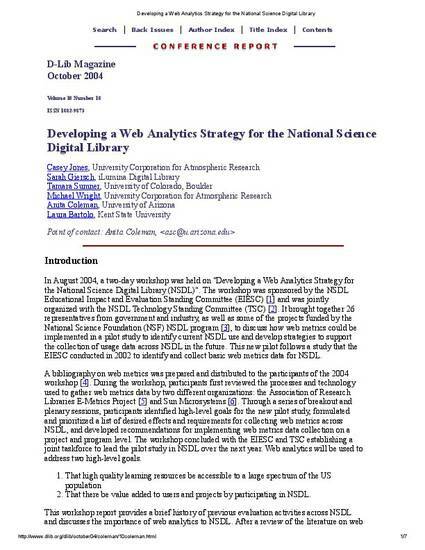 In August 2004, a two-day workshop was held on "Developing a Web Analytics Strategy for the National Science Digital Library (NSDL)". The workshop was sponsored by the NSDL Educational Impact and Evaluation Standing Committee (EIESC) and was jointly organized with the NSDL Technology Standing Committee (TSC). It brought together 26 representatives from government and industry, as well as some of the projects funded by the National Science Foundation (NSF) NSDL program, to discuss how web metrics could be implemented in a pilot study to identify current NSDL use and develop strategies to support the collection of usage data across NSDL in the future. This new pilot follows a study that the EIESC conducted in 2002 to identify and collect basic web metrics data for NSDL. A bibliography on web metrics was prepared and distributed to the participants of the 2004 workshop. During the workshop, participants first reviewed the processes and technology used to gather web metrics data by two different organizations: the Association of Research Libraries E-Metrics Project and Sun Microsystems. Through a series of breakout and plenary sessions, participants identified high-level goals for the new pilot study, formulated and prioritized a list of desired effects and requirements for collecting web metrics across NSDL, and developed recommendations for implementing web metrics data collection on a project and program level. The workshop concluded with the EIESC and TSC establishing a joint taskforce to lead the pilot study in NSDL over the next year. Web analytics will be used to address two high-level goals. That there be value added to users and projects by participating in NSDL. This workshop report provides a brief history of previous evaluation activities across NSDL and discusses the importance of web analytics to NSDL. After a review of the literature on web metrics, the report identifies cross-cutting issues that affect implementing web metrics in the upcoming pilot study (e.g., build vs. buy, data ownership and storage, organizational structure that supports ongoing data collection, user privacy); describes the goals and requirements for the pilot study; and lists near term action items for the joint task force. Documents from the workshop, including a preliminary report entitled "Workshop on Web Metrics in NSDL", slides from ARL and Sun Microsystems presentations, participant statements and the web metrics bibliography can be found on the workshop website.